Prince Alfred Park Soldiers' Memorial, Parramatta. Following the end of the Great War thousands of memorials were erected in suburbs and country towns across Australia. The world had witnessed death and destruction on a scale never before seen with many Australian families affected by a tragedy, loss, or wounding of a family member. In response communities and government rallied to create memorials to act as focal point for remembering the sacrifices made and to display pride in the soldiers lost in war. The Prince Alfred Park Memorial was erected to remember those from the Parramatta district that had served and fallen in WW1. But behind the smooth, noble, and sombre facade of the obelisk lays a story of its inception, design, and location that speaks of a community’s voice, their debate and involvement, as well as the growth of a local council. Flyer for the Grand Sports Carnival. Fund raising was embraced by the community to support this cause. 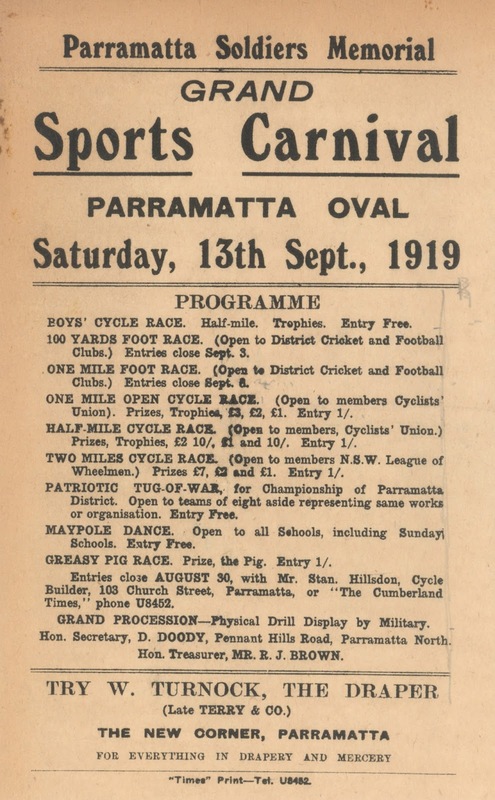 To raise funds for the memorial a range of events were organised including, among many, a Parramatta Soldiers Memorial Grand Sports Carnival in September 1919, a concert in November 1919 organised by girls from the Parramatta Industrial School with the assistance of local artists, a Soldiers' Memorial Carnival that ran for a fortnight in March 1920 and raised almost 900 pounds, and a performance of the "Counsel for the Defence", a comedy performed at Parramatta Town Hall in July 1920. The selection of a memorial design was entrusted to a Committee representing business, Council and the community interests. In September 1919 public notices began to appear in the local papers calling for competitive designs for a soldiers’ memorial and honour roll for Parramatta. Expressions of interest were received from artists and companies including Fredrick W. Tod, the Wunderlich Company and Percy Calve. From the inception of the idea for a memorial the site was a vexatious and emotional question. The community had debated for three years over the most appropriate site only to be overruled by State Government authorities. Still Parramatta insisted that the memorial be erected at St Johns. The general feeling of the people of Parramatta and district was this was their memorial and it was they who should decide on where it should be and what it should look like. It was a real test of the resolve of the Department of Local Government and the strength of the Act to ensure it stood firm with its decision not to have the memorial at St Johns against the protestations of the Council and community. The Public Monuments Advisory Board approved of Prince Alfred Park site but recommended that amendments be made to the original design before approval for the monument could be made. It was decided, mainly based on the costs of inscribing names, that only the names of the fallen were to be inscribed on the monument. The names of those who left Parramatta though, would be inscribed on vellum, and placed in a casket in the monument, where they would remain for all time. Lady Forster placed within a cavity of the obelisk a parchment roll upon which were inscribed the names of all Parramatta soldiers and sailors who had served during the Great War. placed within a cavity of the monument by Lady Forster. This Monument has since been dedicated to those who had served in World War Two, Malaya, Korea, Borneo, and South Vietnam. It remains a gathering point for ANZAC day Memorials. It has and will perhaps always be a reminder of the effects of war, but at another level this memorial, through its history of how it came to be - the community involvement, fund raising through public subscriptions and events, the debate over the preferred site and design, whether names should be inscribed on the monument or not – also symbolises community spirit, participation, debate, and the evolution of a city. Perhaps one could also see this as a monument to a town coming of age.